You know how part of the stress/excitement of going somewhere new is that it’s all fresh and every thing you see, you are seeing for the first time? When you are responsible for yourself, or maybe your family, that’s part of the adventure and completely expected. But when you are the person who is responsible for 100+ other people, the majority of them children, it’s not nearly as exciting and frankly just plain worrying. So, when the boss sent me an email that requested (strongly) that I go on a special trip in advance of our scheduled tour to Italy in the summer, the thought that I was the advance guard was the first thing my mind jumped to. I could take pictures of EVERYTHING I thought might be of help to chaperons and children. I could be familiar with the airport and hotels. I could get the skinny on social and religious expectations since we will be performing in many a religious venue. True, I have to go by myself, which is a little daunting to me, but honestly, I’m ok with going to observe. 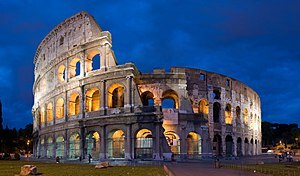 This trip is for the leaders of various musical groups that will be touring Italy in the near future and is designed to give them a taste of what their group could expect. It’s an interesting promotion idea to get directors fired up about international travel in a time when maybe they hadn’t been considering travel. Since we are already committed to a tour, for us it’s a useful tool, but I’m certainly not the leader of a musical group in the traditional sense of things. Sure, you could line up the 384 students we have and I’ll know all of them by name with the exception of a handful. And I can probably tell you their mom’s name and what campus they go to and just about any other functional or logistic fact about them. But ask me about a composer, or a style of teaching or anything else along those lines and I’m going to smile and nod. I love music. In fact, music is probably the one thing I’m most passionate about. (aside from my children and my cat) My entire being responds to music, but ask me about the way music is made or who makes it, and I’ll stumble. It’s ok that I’m not educated to the extent my boss is.. I can still appreciate music, and I definitely hear things that have merit when I figure out how to express them, but I don’t express that very well verbally. So, the thought of sitting on motor coach or at the dinner table with directors has me a little daunted. I want to make a good impression on behalf of the group I work with. I’m going into this with the thought that even though I’m not formally educated in music, I love it and this is an excellent opportunity learn more about how it all works. Italy in February. Wow.. better step up those Italian lessons! When I was in my late teens, I used to ask for a man that had a certain set of qualities. I feel very blessed that the Universe was listening. On this, your 45th birthday, I wanted to let you know as many of the the things I appreciate about you as I can muster. Please remember, this will always be an incomplete list, as we are ever growing and I’m constantly finding new ways in which I appreciate you. You use words like “spiffy” and “indeed” regularly. You are very warm, both physically and emotionally. You will eat just about anything I cook and have only complained once or twice, but were always careful not to hurt my feelings. You cared for my daughter all those years ago as if she were already yours. You sat in a wagon with a sparkler in your hand and a silly grin. You teach me new things all the time. You love my cat, too. You make my work, your hobby. You enjoy being with children – ours and the others that enter our lives. You juggle anything you can find three of. It’s great to see people smile when you pick up three of something in the grocery store and play. You dance with me in the most unexpected places… bowling alleys, sidewalks, store aisles. You sing from your heart. You smile at me, just.. that.. way..
You took a few years before letting me know your passion for aircraft. You’d clean up the blocks too, even if you hadn’t played there. You fall asleep just about anywhere, usually so you can spend more time with me. You are very caring and self sacrificing – but never bitter about what you give up out of love. You are tall and handsome. You like the scarf and the effort and story behind it. You enjoy motorcycles and feeding the birds. You are a geek, and brilliant. You have a temper, but not often. You will stand on a chair to make a point – or just to be silly. You are very curious about lots of things. You are solitary and all inclusive at the same time – how do you do that? You are hardworking and responsible, always putting my needs and the needs of the family above your own. You can find something to talk about with anyone. You thank military personnel, stand for the National Anthem and remove your hat out of respect. You love to take walks. You are lazy at times and show me that it’s ok to relax now and then. You kiss me every morning and every evening and when you come home and when you leave. You freely tell me you love me – just the way I am. You somehow won over my Mom and Dad. You are all these things and more and I could go on forever and never be done. I celebrate your birth and having you on the planet and in my world. For some reason, Hubby and I were both up by 5:30 yesterday, so we went out to breakfast and went grocery shopping for the items needed for his birthday dinner. He wants some meatloaf and mashed potatoes. May sound ordinary to you, but mashed potatoes are a rarity here. We normally eat sweet potatoes because they are better for you than the common spud. I came around an aisle and noticed that a cardboard display rack had some bulk packaging of spices in each display hole. These were high-end spices. Cinnamon, Cloves, Cardamom, Ginger and some Poultry seasoning. Each of the single jars run from 6-10.00 each and there were six jars per pack. Both Hubby and I knew they weren’t supposed to be packaged that way, so Hubby took a pack up to the manager so he’d be aware of the error. When they both came back to the display area, the manager nodded his head and said thank you for alerting him, but in the meantime, go a head and choose as many as we’d like in the bulk packaging. If any of you bake out there, you’ll know that Cardamom alone is worth tons, and the single jar price is around $10.00 each and this man just offered us $60.00 in spices. I felt like I was falling back through time to the spice trade era and was wondering if I had some silk to spare…. nevertheless, we asked again and he offered for us to take whatever we wanted, so we did. I am now flush with about $130.00 worth of cinnamon, cloves, ginger and cardamom and prepared for the baking season to begin. 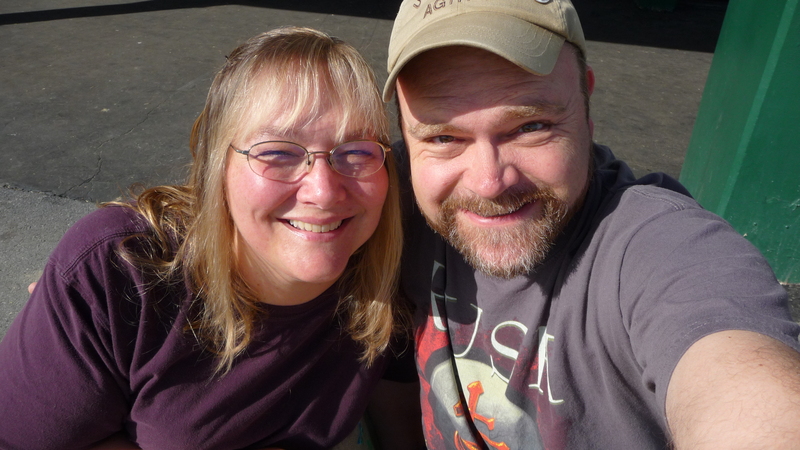 After putting away the groceries, we headed out to the local track to sit in the sunshine (beautiful day) and sip a few beers and watch the ponies run. We do bet, but our bets are usually no more than $2.00. I’ve discussed my “system” for betting before, but as a brief review, I simply guess. It could be a name, or a color or a gut feeling that I have, but whatever it is, it usually works. On the first race I won $21.60. I should know to trust my guts by now, because right before Hubby went to place the bet, the thought crossed my mind that I should bet to win, but I decided Show would be good enough and off he went. If I’d stuck with my guts, I would have won $79.00, but I was happy with my $21.60. We continued to enjoy the sunshine, and the $2.00 Hook and Ladder draft beers, winning and losing a few dollars here and there until I finally needed to use the ladies. On my way, I walked past the simulcast section and saw a man who was cheering on his horse, which isn’t anything different at a race track, but what was interesting was that it was so much like a song, it stopped me. Once he had finished cheering, I asked him what nationality he was because his cheering had such a sing-song quality that I just had to know. He told me he was from Trinidad and politely posed for a photo when I told him I’d probably include our encounter in my blog. In keeping with our theme, it was Military Appreciation Day at the track. There were military vehicles on display and a presentation of colors by a local color guard. They also held a Rody Race, where members of the military rode hoppity-hops on the track with a donation going towards a Military Recovery fund. 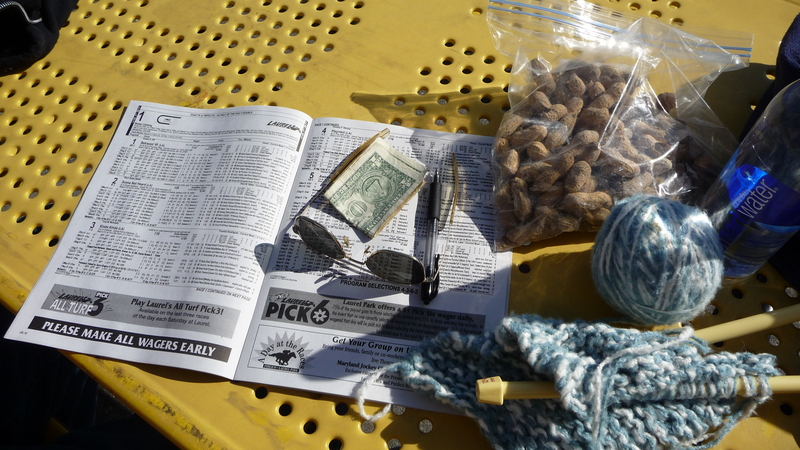 The rest of the afternoon passed nicely until the 8th race when Hubby and I liked the same horses. 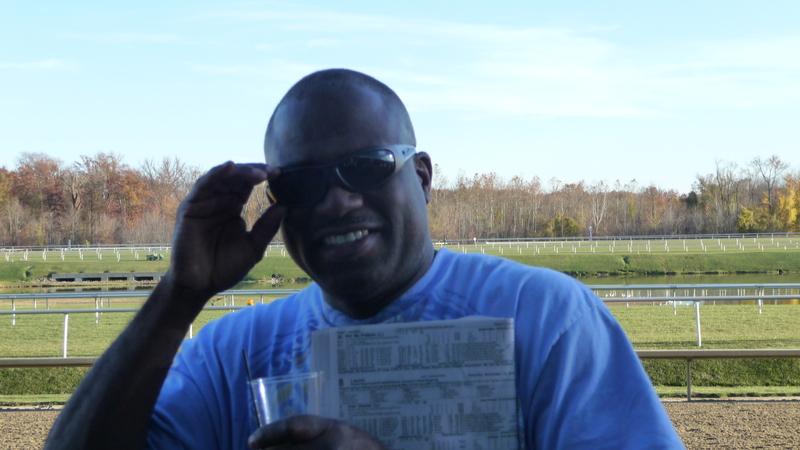 He took my choices and bet them two different ways, and since I’d been right on both horses, we won $185.00. Granted, it’s not the MegaMillions Lottery or anything, but we were happy with it! During most of the afternoon, we got to listen to a great band called “Sons of the Radio”. We even bought one of their CD’s. What can I say.. we support local musicians! This is not at the track, but this is the band. Luckily, I had my cell phone in my purse and we got in touch with our son, who came and rescued us from having to sit hungry and cold on our front porch until our daughter came home from work. Because we appreciated him coming out to help his silly parents – and we just like being with out kids – we treated him to a burger as well. Tomorrow on the Birthday Bash List of Events – Buffet Breakfast and Bowling! Tonight was the kick-off for Hubby’s weekend of birthday celebration. We decided to go to a local bar that’s just 2 blocks from our house with the intention of sitting in the sunshine and having a beer or two. This bar has a deck with heaters that sits so high, it’s close to the foliage of the trees and overlooks a river. It’s a nice place, but the service has never been stellar. That’s ok, we weren’t in any kind of hurry. The clear blue sky, crisp air and sun illuminating the yellows and reds of the leaves was stunning, and it was nice to watch a solitary leave tumble through the air here and there. We used to go to this bar every Friday night for a few years. We even had a special table, but then we stopped going right around the same time my son stopped being the dishwasher. We had many a fine night there, laughing and talking with friends. In fact, Hubby celebrated his 40th birthday there. He saw the look of confusion on my face and continued to tell me that brown shoes were part of the Naval Aviators uniform and had been since the dawn of time (or at least Naval Aviators). Hubby grew up near a military base and the military has played quite a role in his life, even if he’s never been active in the service. He continued to educate me on the subtleties of the military fatigues and uniforms. Did you know that square-ish green/khaki digi cammo is army and blue/grey/khaki with a swirl is Air Force? Neither did I. And there was some discussion about patches and their meanings as well. 1. That was awesome. And you could hear in their voices that the men were very appreciative of his show of support. 2. Hubby is a pretty shy guy when it comes to opening up and showing who “he” is. This was near and dear to his heart and took a lot for him to do. I was proud of him for doing it. The rest of the evening paled in comparison although I have to say the conversations that went on around us which varied from cyber-security, new age spiritualism and hunting was pretty interesting as well. Tomorrow we hit the track! I figured it was time to get the muscles all happy again, now that my leg has healed and I’m all better. Today I got nice and sweaty and I felt really good, but I was redolent as well. And I smelled just like Pollo Fuego. Eww.. that’s not right. BO and the smell wafting from a restaurant shouldn’t smell similar. It confuses ones mind. What if I catch a whiff of myself and get hungry. Could this sweating thing become contradictory to my workout efforts? Will I have an allergic reaction to my own pits? I think it’s best not to dwell on this for too long. I did find this, however, so if you like to learn useless bits of info, take a look. I had just gotten used to Windows 7 and had customized things, through trial and error, just the way I liked it. I had bookmarks set, email settings right, passwords saved and all was wonderful. Until.. Slowly, this evening, I’ve been doing exactly that. And for fun, I figured out how to put a music and file sharing box on my WordPress blog. I’ve heard there were some who couldn’t click my link to https://sharons7th.wordpress.com and I wonder if you tried to copy and paste the url if it would work. Slowly, the next incarnation of Snippets and Tidbits (and hopefully the last one) is coming together. It’s been fun to put it all together. This is a photo of me and my grand-daughter, Lillianna. 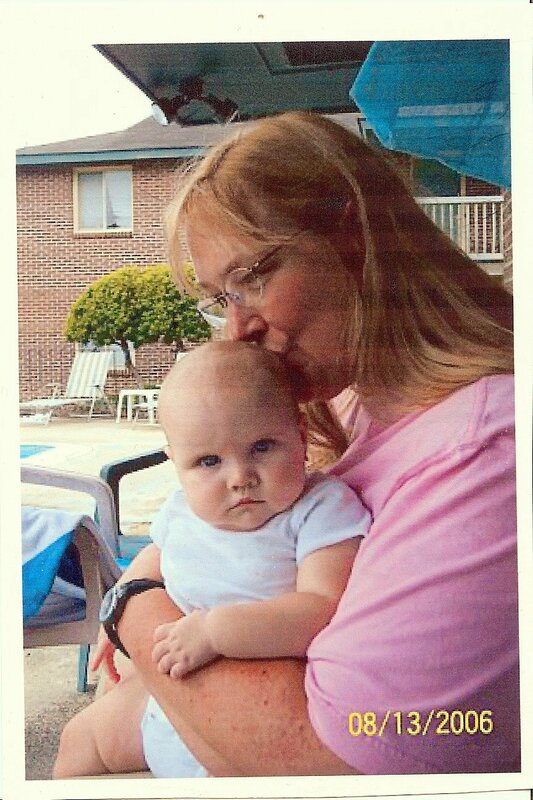 It was taken in August of 2006 when my then best friend and I traveled to visit my daughter and her girls. My daughter was just starting a custody battle with the father of her first two children and Lilli’s father. At the time this was taken, the other two grand daughters were happily playing in the pool and my friend was sitting next to me and snapped this photo. It’s one of a few all time favorites of mine for a number of reasons. 1. The look on Lilli’s face is priceless. She’s so expressive here, with a look that seems years beyond her small little body. 2. I look natural. I’ve got a baby in my arms, I’m giving her a kiss and I’m happy. Even though I was worried about the situation, I had family and friends with me and I knew I was well-loved. In a rare and unguarded moment, this photo shows my love and attachment. 4. I only have one poorly printed copy of this photo, which makes it even more precious. As you can see, it’s out of focus, grainy and has some obvious printer lines through it. I printed it out long ago, but through various crashes and data issues, I think I’ve lost the original digital version. This is a scan of the paper photo I have. Just like I’ve lost a ton of music to various issues and ignorance, I’ve lost some photos, too. I’m lucky I have this paper version, but if the person who took it happens to have a digital copy, I’d be forever thankful if you could send it to me. 5. The probability of my request never being answered in number 4 is what makes a number 5. There are some people who touch you deep down inside who you think will be with you forever and then, they aren’t. There is no blame, no guilt, no finger-pointing, just nothing. They aren’t there, they aren’t available and sometimes, for no other reason than you really liked them for who they were, for the things you shared (like this snippet of time) the easy conversation and the laughter you had, you miss them. 6. This picture is a small slice of time right before things went pretty sour. My daughter lost her custody battle and all three grandchildren were taken from her about a year later and the person who took this photo was gone not too long after that. When I look at Lilli, I think of that sunny afternoon at the pool in front of my daughter’s apartment. The girls were splashing and playing in their floaty suits, having a ball with some friends. They were happy. Lilli was warm and soft and felt so good in my arms. Shortly after this photo was taken, my friend was holding Lilli and was singing Barney songs to her. She tugged on her ears, gave him a look and put her head on his shoulder. It was an innocent, trusting, sweet and memorable moment.